Such a hateful program is both anti-Semitic and negationist; to cast doubt on the testimony of our dwindling holy Survivors will not be tolerated. Allow me some well-placed phone calls to have it banned presto! The second pic is definitely not of a 16 year old; it’s obviously not of Eli Wiesel either. 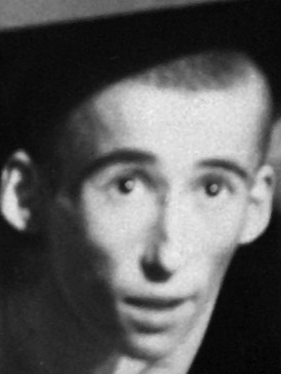 I doubt anyone would honestly think that pic to be of a young Eli Wiesel. Who is seriously claiming this? Thanks Blake. I appreciate your doing that. Through tests done by another friend on some of his own pictures, I knew the “age meter” estimated ages on the high side. It is not, of course, as good as our own human eye-brain can do. But it does distinguish between children and youths and adults. I think the comparison of Grüner, who was actually 16 at the time, and the “round-headed man” makes it very clear to every honest person that the round-headed man cannot be Wiesel. This should really put an end to this part of the hoax..
Who is claiming this? Well, read the articles I linked to. But to answer … Elie Wiesel; President Barack Obama, The New York Times and every other newspaper in the U.S.; Yad Vashem Shoah Memorial in Jerusalem,; The United States Holocaust Memorial Museum in Wash. DC; the Buchenwald camp memorial association in Germany; and every holocaust historian and believer, including all the mainstream media in the world goes along with it. Can any of those institutions be taken seriously? Oh great, just what the world needs: another denial of the Holocaust! Is Mel Gibson one of your founders? “Allow me some well-placed phone calls to have it banned presto!” Abe Fauxman, you clearly prove the nepotism surrounding all this, well done, couldn’t have said it better than you.